Crystal Patterns by John Neville Cohen. Page 4 of ten pages. Spectacular patterns can be created by the use of crystals or prisms. 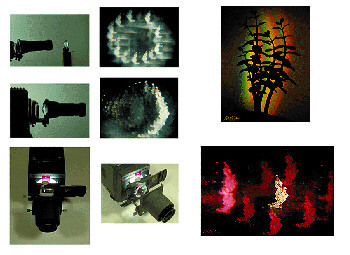 Apart from the special effect types available for use on the camera, remember these can be used with the projector too, it is also interesting to use old crystals designed to form a chandelier. Experiment with different crystals placed in front of the projector lens, not always square on, and see how the image scatters according to the cut. The best results are often found to be with a fairly small image within the transparency frame. Quite a different pattern will be formed, by moving the crystal behind the lens. Obviously as these crystals are not optically perfect, the projected image will lose some definition, but it can still be useful as a background image, as was the case in plate 16 (above). This study was created with two projectors as described in the next chapter. Blu-tack has been found to be a good way of fixing the crystal, filters, or masks in place. It is also used to form an easily changeable shape of mask when applied to a thin glass that is placed behind the projector lens. One other useful aspect is that a colour spectrum can easily be formed with the projector and made to appear wherever it is required. Plate 17 (above) was created in this way. No other light was needed. The cactus plant simply stood in front of the projected rainbow colours and was then photographed in silhouette. Photography has the advantage of instantly reproducing an image in a number of ways. Just by the selection of film the image can be in black and white, colour or in either of these choices it could also be in negative form. All these can be projected! Negatives can be unusually beautiful in themselves and they should not just be regarded as the means of obtaining a print. The choice of projected images should not be restricted to transparencies but include film in all its forms. Black and white images positives or negatives can be projected and used. Colour can still then easily be added to the black and white projected images by the choice of screen, as well as by the introduction of colour filters. Many filters are available for the camera, and these can be used with the projector too. But any bits of coloured cellophane can also be used with the projector. There are hundreds of colours easily available, as one only needs such small pieces. If it is possible to obtain a sample swatch of transparent colours these will prove ideal. Even if they are not optically of use with the camera, if used between the projector condenser lens, and the film, they can influence the colour of the projected image, without any optical problems. With care it is also possible to change the colours of specific parts of the projected image. Here is a good excuse for eating more of those sweets, after all those cellophane wrappers now need to be saved!